Preseason football! It’s here and we’re being rewarded -- uh, I guess -- with 12 games tonight to satisfy our NFL cravings. But really, the preseason might not be that bad this year. You may want to turn the games off after the first quarter, but in case you’re debating which games to watch (you can watch live out-of-market games on NFL Gamepass) we’ve ranked all 12 games in order of watchability. 2. Pittsburgh Steelers at Philadelphia Eagles, 7 p.m. The Super Bowl champions are back in action and facing off against the three B’s: Ben Roethlisberger, Antonio Brown and Le’Veon Bell. Except, it’s possible none of the three B’s play. Bell is holding out, Roethlisberger plans to sit out and the same may be true of Brown. At quarterback, we’ll get to see rookie Mason Rudolph’s NFL debut, which is a reason to watch. As for the Eagles, don’t expect to see Carson Wentz as he continues to recover from his torn ACL/LCL. Nick Foles might not play either as he’s dealing with a minor upper-body injury. 3. Los Angeles Rams at Baltimore Ravens, 7:30 p.m. The Rams are coming off a surprising 11-5 season and the Ravens have a first round rookie quarterback on their roster in Lamar Jackson. That should make this game one of the better ones tonight. It’ll be interesting to see if Joe Flacco and Jackson share the field at all during the game as the Ravens have said that could happen this year. Jackson didn’t impress in the Hall of Fame game, so tonight he’ll be looking to improve upon that performance. 4. 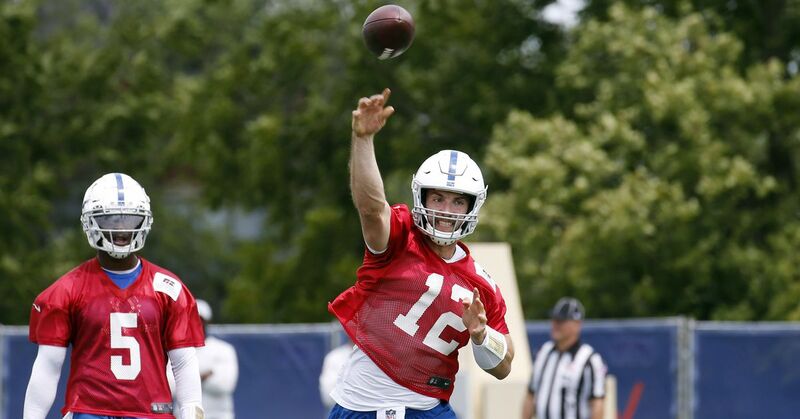 Indianapolis Colts at Seattle Seahawks, 10 p.m.
Andrew Luck is making his return to the field tonight after missing all of last season with a shoulder injury. He’s expected to play for the entire first quarter, making this one of the best games of the night. Wide receiver T.Y. Hilton has big goals for this season, so the QB-WR duo building back their connection will be key. For the Seahawks, running back and first round pick Rashaad Penny will be a player to watch as will fifth round rookie linebacker Shaquem Griffin. Honestly, Griffin is reason enough to watch this game as just about every NFL fan is rooting for him to succeed. This game will also be available for a national audience and features Jimmy Garoppolo. Is it coming in too low on the ranking at No. 5? The Patriots turned 49ers quarterback is only expected to play for one series, but how he does will be a top storyline of the night. Plus, there are only two games on at 10 p.m., so if you’re staying up late, this is the game to watch. 6. Houston Texans at Kansas City Chiefs, 8:30 p.m.
Patrick Mahomes hype is all the rage in Kansas City and Deshaun Watson is expected to make his return following a 2017 ACL tear. Mahomes is actually expected to play for the full first quarter, making this one of the more watchable game. It’ll be interesting to see if the many Texans players who were injured last year -- like J.J. Watt and Whitney Mercilus actually play. Fingers crossed, as that will make this game fun and more difficult for Mahomes who is a first year starter. 7. Carolina Panthers at Buffalo Bills, 7 p.m. This game is ranked so high because of the Bills’ quarterback competition and the opportunity to see Josh Allen in action for the first time. Allen, the No. 7 overall pick in this year’s draft, isn’t likely to start at quarterback come Week 1. It’s former Bengals backup AJ McCarron and second-year quarterback Nathan Peterman competing for the right to start. McCarron has had an edge in training camp but the Bills will really be making their decision based on preseason play. Rookie wide receiver D.J. Moore will be a top player to watch for the Panthers as the team’s first round draft pick. The Panthers have already experienced a number of injuries (left guard Amini Silatolu, right tackle Daryl Williams and cornerback Ross Cockrell) making the offensive line and cornerback battles some of the most important to watch. 8. New Orleans Saints at Jacksonville Jaguars, 7 p.m.
Two teams coming off hot 2017 finishes, the Saints and Jaguars are both expected to contend for playoff spots again this year. The Jaguars’ first round rookie, defensive lineman Taven Bryan isn’t likely to play as he’s dealing with an injury, but it’ll be nice to get a look at how these teams changed during the offseason. The Saints have quite a few position battles brewing, including the running back position where guys like rookie Boston Scott and second-year back Trey Edmunds will be fighting for reps during Mark Ingram’s four-game suspension to start the year. 9. Washington at New England Patriots, 7:30 p.m. When was the last time the Patriots ranked this low on a list? If you watch this game, it’ll be interesting to see Alex Smith leading the charge in Washington after being traded away by the Chiefs earlier this year. He made the Patriots look silly in last year’s regular-season opener. Washington’s rookie first round pick Da’Ron Payne won’t be in action as he deals with a minor injury. The Patriots’ two rookie first rounders -- offensive lineman Isaiah Wynn and running back Sony Michel -- both out of Georgia, will be guys to watch. 10. Chicago Bears at Cincinnati Bengals, 7 p.m.
11. Tennessee Titans at Green Bay Packers, 8 p.m.
Aaron Rodgers isn’t expected to play at all and while you may be interested in seeing if Marcus Mariota takes a step forward this season, that won’t be apparent in Week 1 of the preseason. If you end up watching this game, here are some under-the-radar Titans to watch and what to know about the Packers’ backup quarterbacks who will be battling it out. 12. Tampa Bay Buccaneers at Miami Dolphins, 7 p.m. Even if you really love football, I can’t recommend watching this game. If you ignore my advice, watch for the backup quarterback play for the Buccaneers, which will be important as Jameis Winston is suspended for the first four games of the year. For the Dolphins, it’ll be Ryan Tannehill’s return game after tearing his ACL last year. Safety Minkah Fitzpatrick may be the most exciting player to watch for the Fins. We all know preseason football can be a bit of an eyesore, but there are actually a few interesting storylines to follow this year! No, really. Could you eat the Cardinals’ 7-pound burger challenge? This is a lot of burger. But if you finish it in less than one hour, you get a Cardinals jersey and your photo on the stadium video board. Hard Knocks recap: Landry was the star, Nassib gave a breakout performance, and Gregg Williams was, well, Gregg Williams. Andrew Whitworth is one of the NFL’s greatest gifts. At 36-years-old, he’s still playing left tackle at an elite level and he’s hysterical, too. The Rams traveled to Maryland for joint practices with the Ravens and it’s safe to say the Los Angeles players weren’t used to the weather conditions at Ravens training camp. Jared Goff even said he’d “never really been practicing in a humid environment like this” before. Click on to check out Big Whit mic’d up. Sign up for Rise ‘n Grind and get all the latest NFL news straight to your inbox.